6 Where is the serial number? 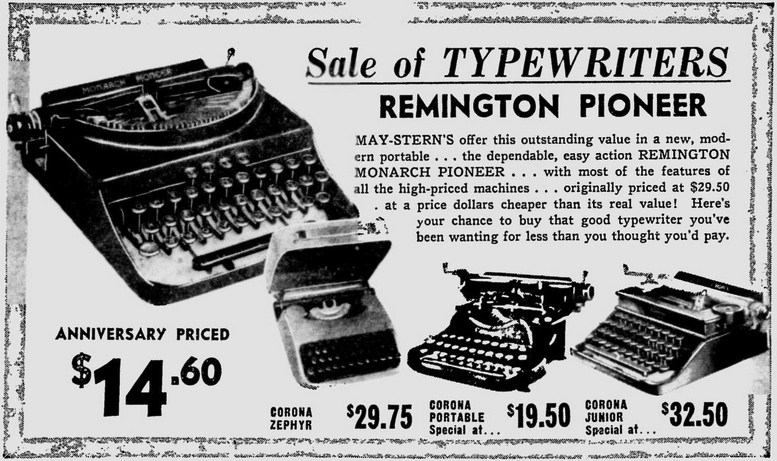 A 1932 advertisement in the Spokane Daily Chronicle reads, “You’ve always wanted a typewriter for yourself and for the children who are growing up into high school and college … now you can own one at a price that is not prohibitive.”1 During the Great Depression, nearly any price may have seemed “prohibitive,” so to satisfy cost-conscious consumers, Remington offered a slew of economy machines, including the Remie Scout Model. 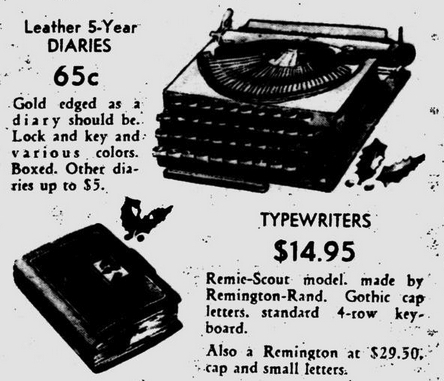 Remington offered two versions of the Remie: an open-framed, all-caps model that sold for $19.75 (sometimes $14.95); and, a closed-framed, double-case model that sold for $34.75. The former was “stripped of all non-essentials,” including shift keys, ribbon selector, right-margin set and backspace — the carrying case was optional. 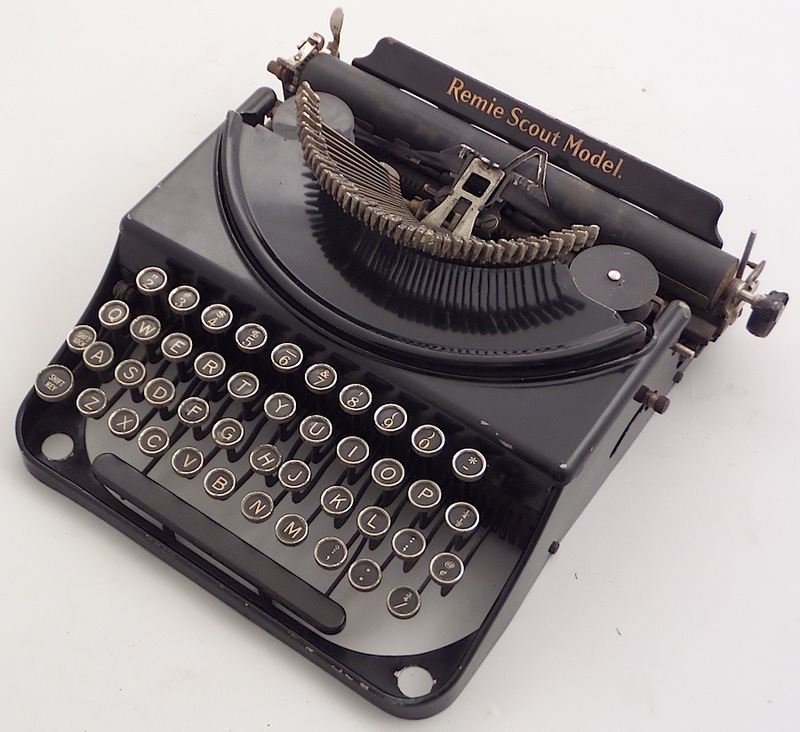 The enclosed-case model incorporated right and left shift keys, though sometimes only left shift, and came standard with carrying case. The lever (center) raised and lowered the typebars for compactness in travel. 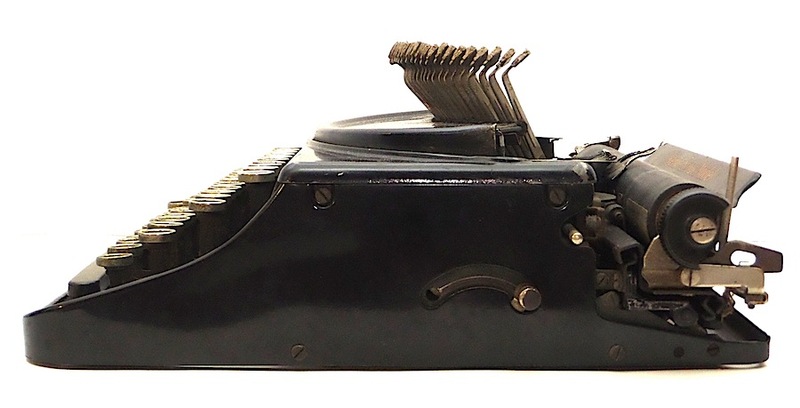 Both Remies utilized Remington’s folding typebar mechanism, first seen on the earliest Remington portables, which were introduced in the early 1920s. The mechanism does allow for a reduction in the size of the frame, and was probably reintroduced during the depression to cut costs. Though unique, the folding typebar mechanism is not an optimal design element, and Remington mostly manufactured portables with a more standard design. 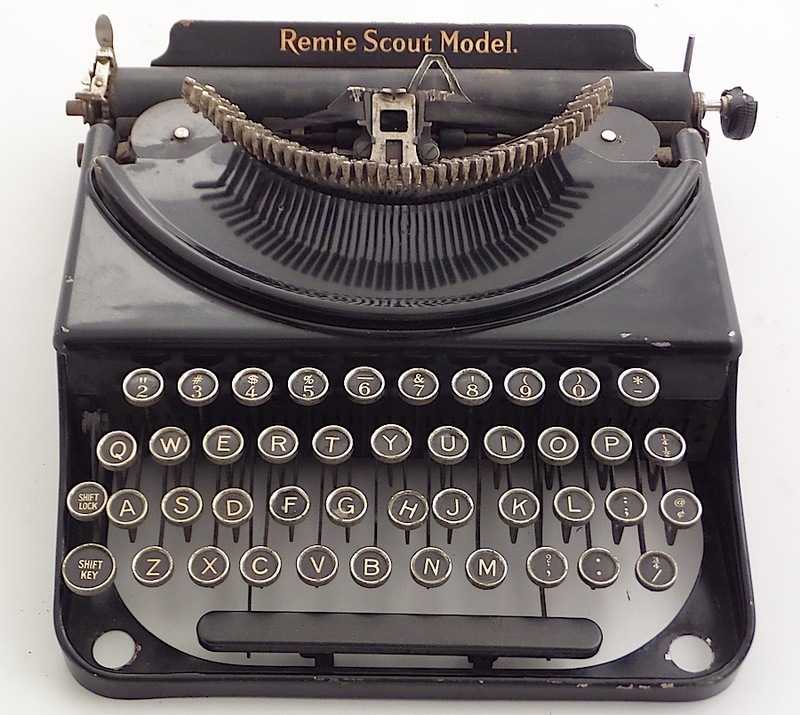 (Note, advertising for the Remie Scout shows the folding typebars in the “resting” position.) That Remington reintroduced the mechanism at all testifies to the economic demands of the times. 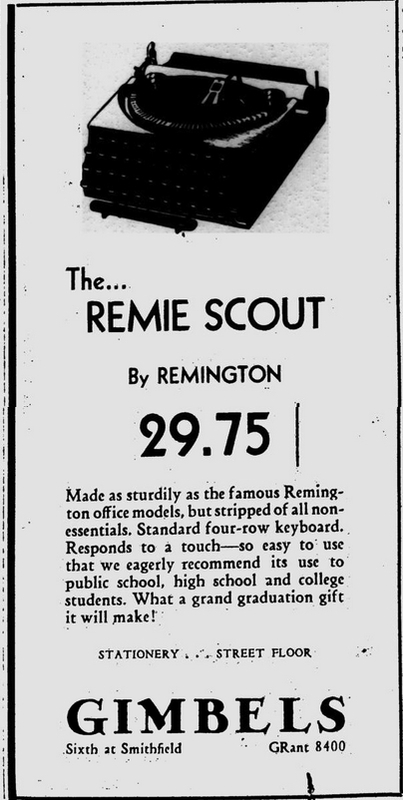 The Remie Scout was marketed heavily toward students, and was the cheapest of all Remington portables during the 1930s. 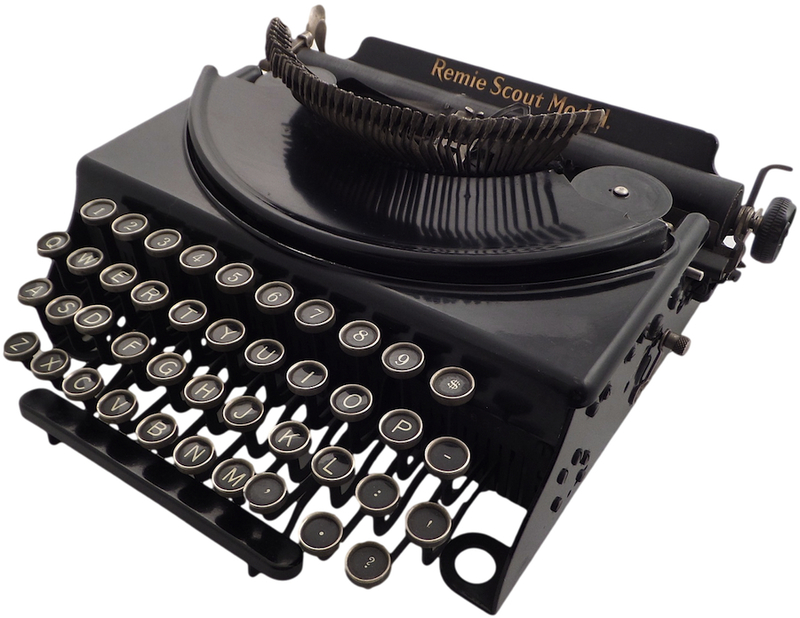 Alan Seaver offers a detailed description of this machine, with all its variations, here: All About the Remie Scout. 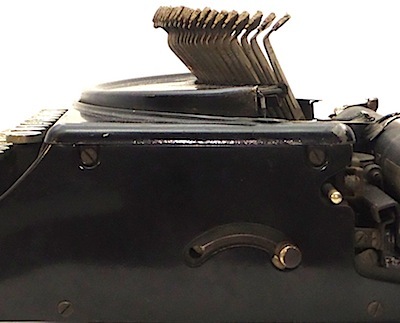 Compared to earlier Remington portables, those manufactured in the 1920s, the Remie is a less sturdy, less elegant machine. Screws are tapped wherever needed — regardless of aesthetic effect — and large gaps are permitted around the folding typebars. 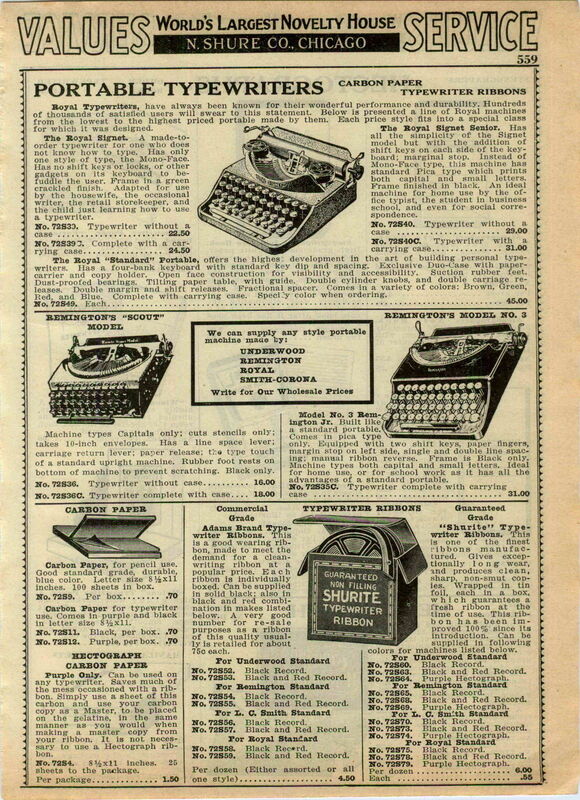 Similar to the Remington Portable #2, a machine introduced in 1925, the Scout is more cheaply made. 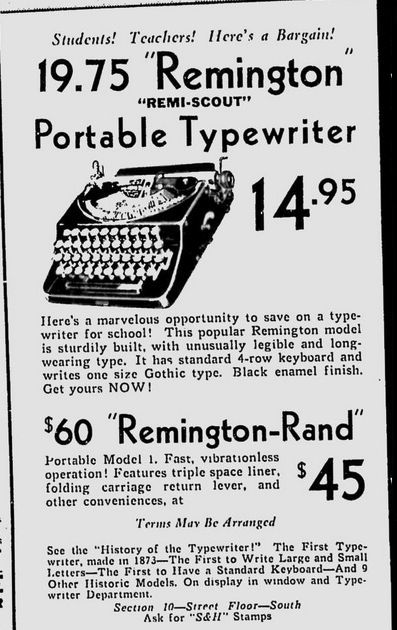 By way of comparison, the 1921 Remington Portable No. 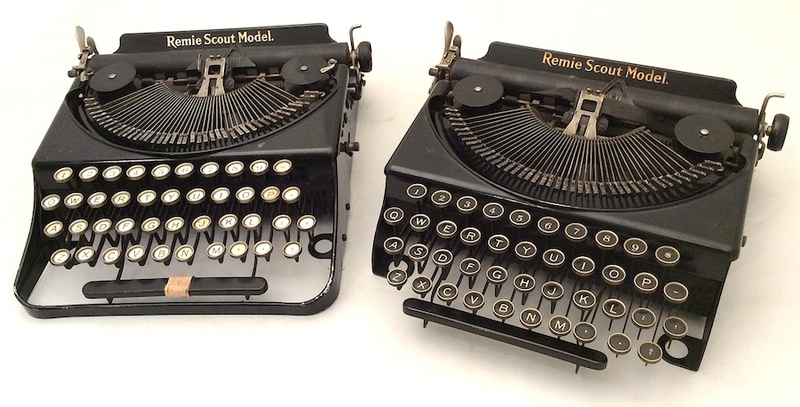 1 (left) is a more substantial machine than the 1933 Remie Scout Model (right). 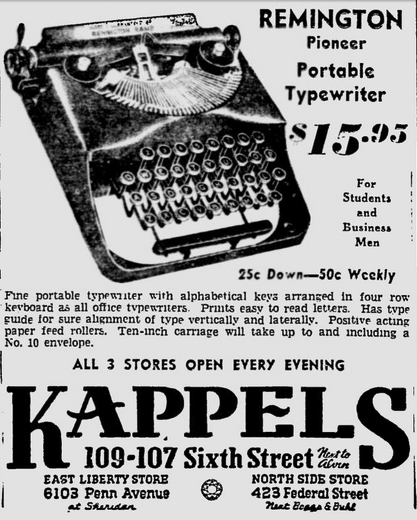 It was also nearly twice expensive, priced at $60 — in 1921! Photo by Etsy seller anodyneandink. Photo by Etsy seller SarahAnntiques. Pittsburgh Post-Gazette, May 19, 1932. This is the highest advertised price for the Remie Scout. It may be that Remington initially overpriced this machine. Also, note the words “stripped of all non-essentials.” Non-essentials? Upper-case? Margin control? 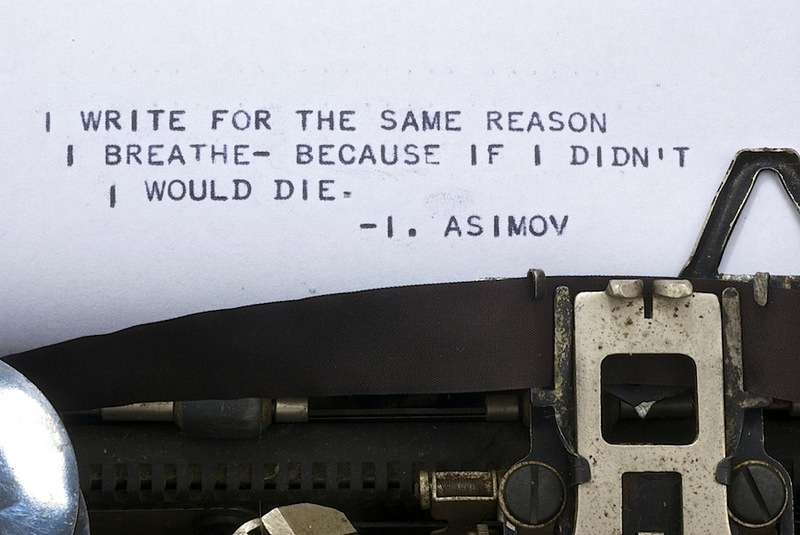 Backspace? — these seem quite essential, but for the money, perhaps this wasn’t a bad deal. Spokane Daily Chronicle, Nov. 9, 1932. Winthrop News, Dec. 15, 1932. Pittsburgh Post-Gazette, Aug. 15, 1933. The Milwaukee Journal, Aug. 20, 1933. 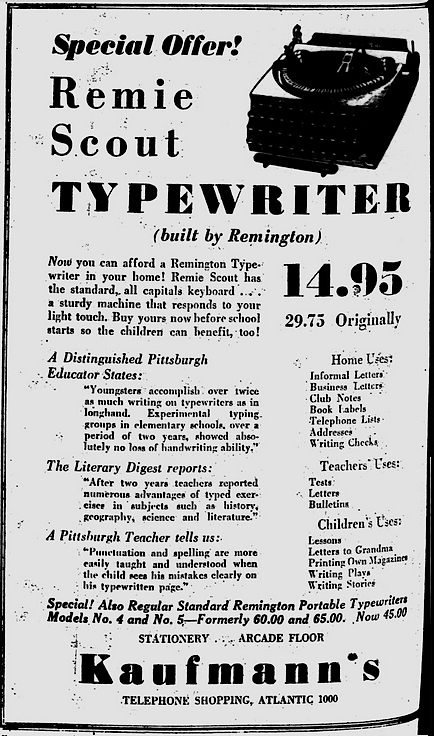 Notice that “Remie Scout” is misspelled and hyphenated. One wonders if the right Remie is pictured — they seem to be advertising the cheaper version. UPDATE (10/27/2014): It appears the correct image — this variant is a caps only model with an enclosed frame (on my machine, the front piece is held in place by six screws; otherwise, it is the standard open-framed machine). Pittsburgh Post-Gazette, Dec. 13, 1933. 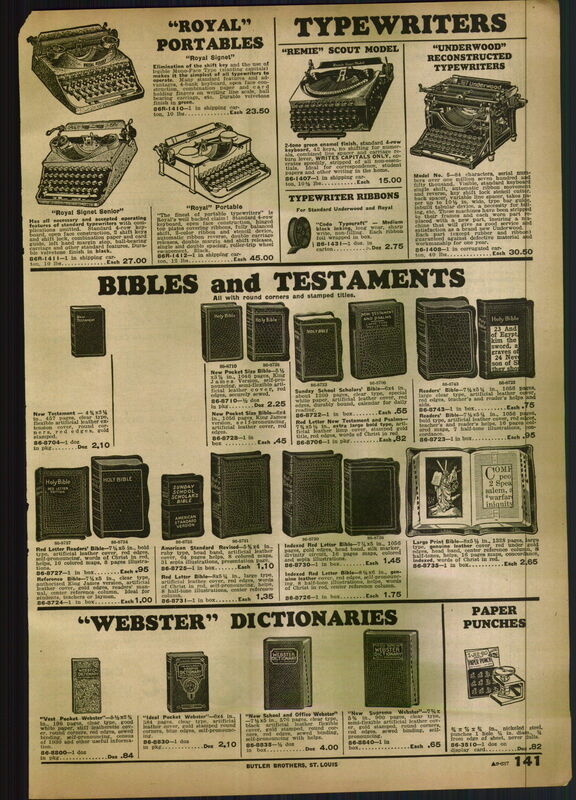 1933 Butler Brothers advertisement. Richard Polt notes that some Remingtons were rebranded for Butler Brothers (see here). 1933 advertisement for N. Shure Co. Click to enlarge. 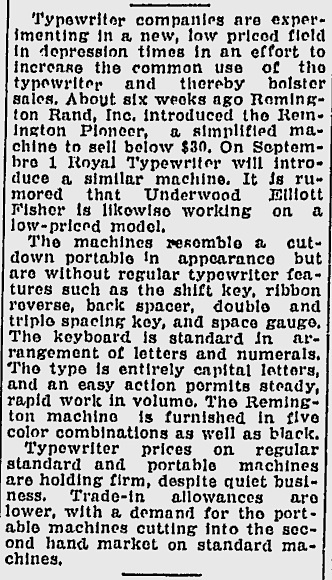 For reference, by the late 1930s, the Remington Pioneer was offered at a similarly cheap price. The Pittsburgh Press, Dec. 7, 1938. The Pittsburgh Press, March 19, 1939. 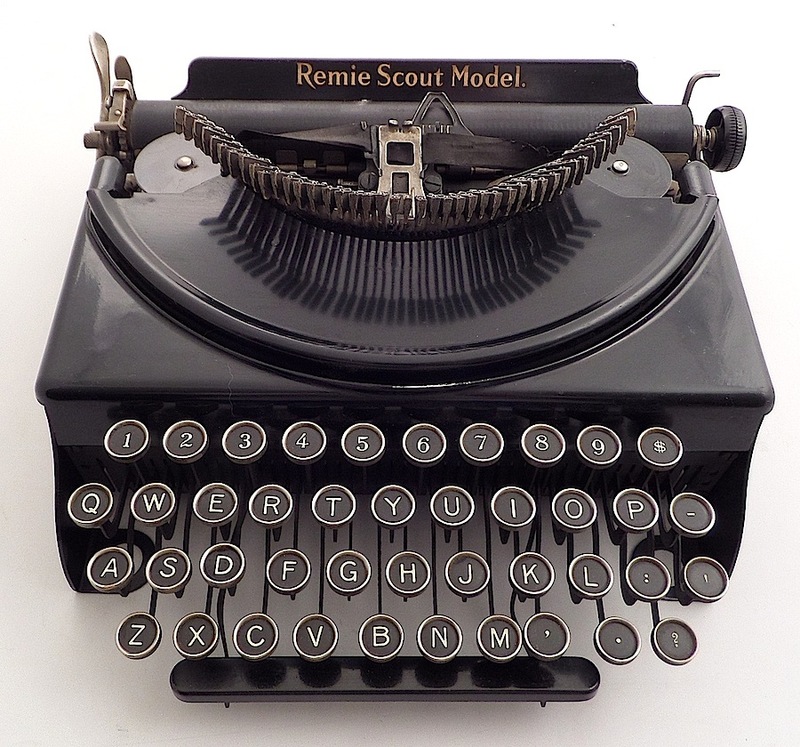 The double-case version of the Remie Scout is more common, but the caps-only version can be found regularly on eBay and elsewhere. Both models came in a variety of colors. The two in my collection are black. Photo by Etsy seller anodyneandink. Notice the profusion of screws on the side of the typewriter. Serial number as seen on the caps-only version of the Remie Scout. 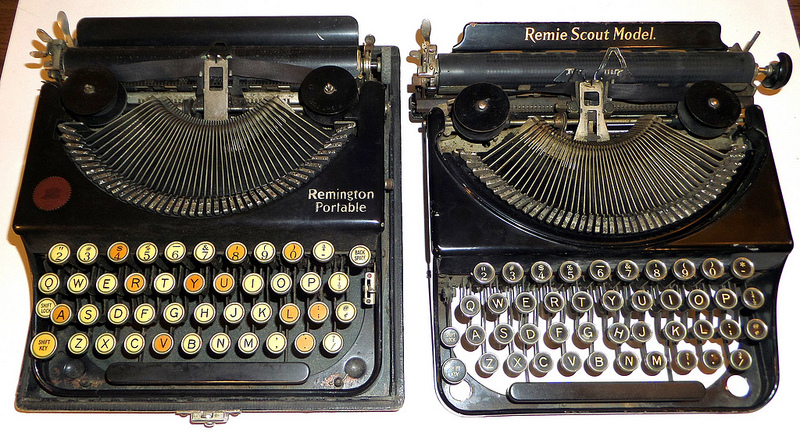 Serial numbers on the Remie Scout are easy to find, but not easy to read. 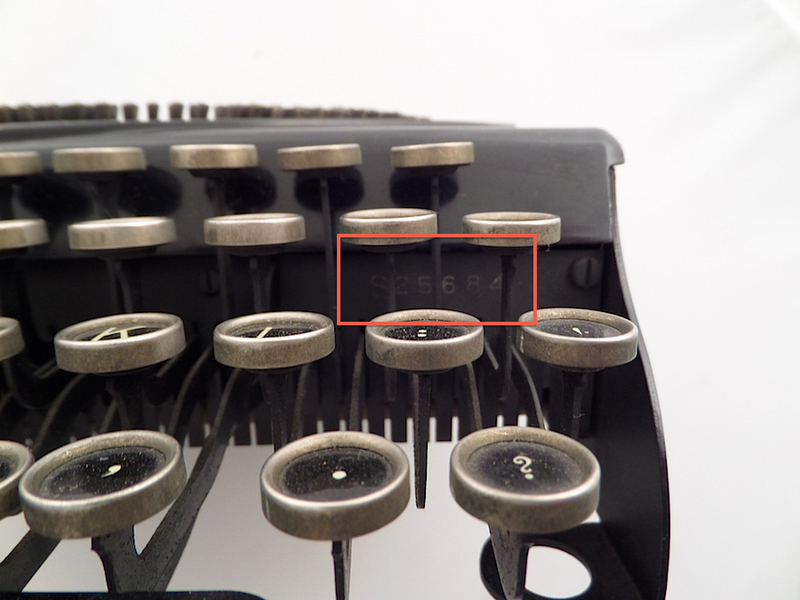 Nestled between the arms of the keys, the serial number (as pictured above) is located on the right-front of the machine. The same is true of some other Remington portables. Sometimes the numbers are only lightly stamped, necessitating the use of a light for shadowing. You may also need to clean grime away to increase visibility. 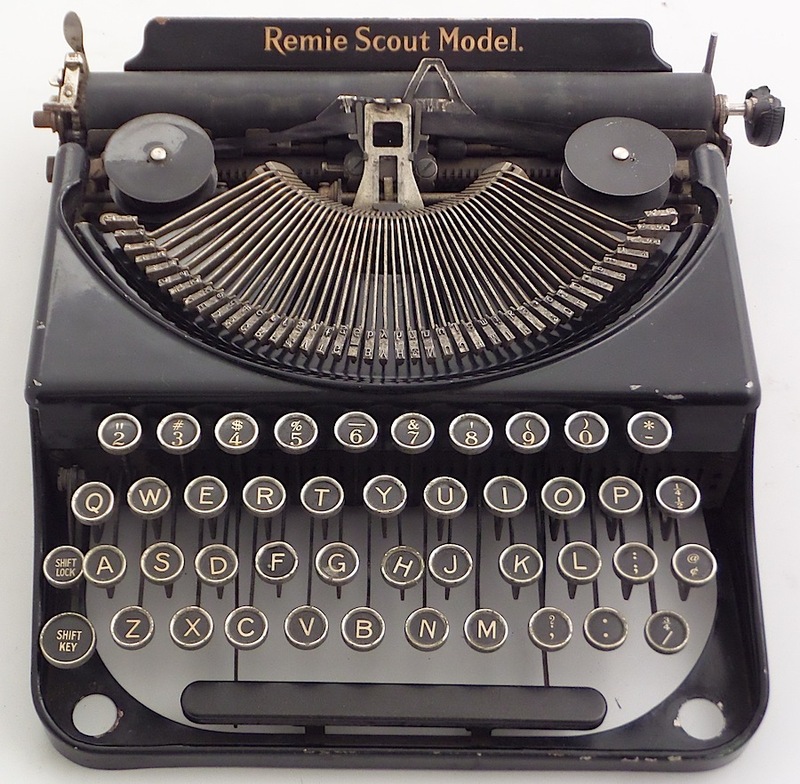 Alan Seaver’s page on the Remie Scout is a useful resource for dating your machine. 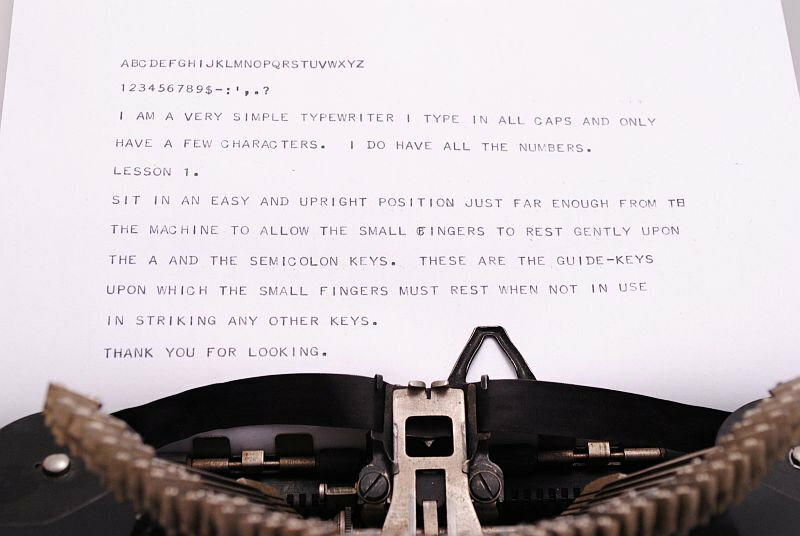 The only differences between these typewriters are the keytops and the front enclosure on the left machine. Read more about this variant in this post. Remington Standard No. 2: "Lower Case" vs. "Shift Key"? One interesting thing about these Remmies is that they often still have the mount holes for the luxuries like the end-of-line bell mechanism, and you *can* install these luxuries if you happen to have them from a parts higher-end Remington portable, although that would obviously affect it’s “originality”. 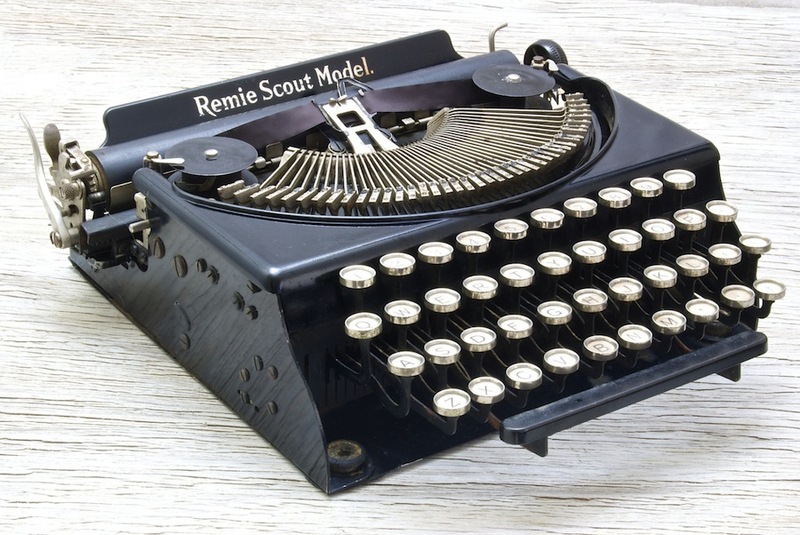 You’re right, the Remie Scout is a solid machine; it’s not cheaply made. Compared to earlier Remington portables though, it does feel less substantial. 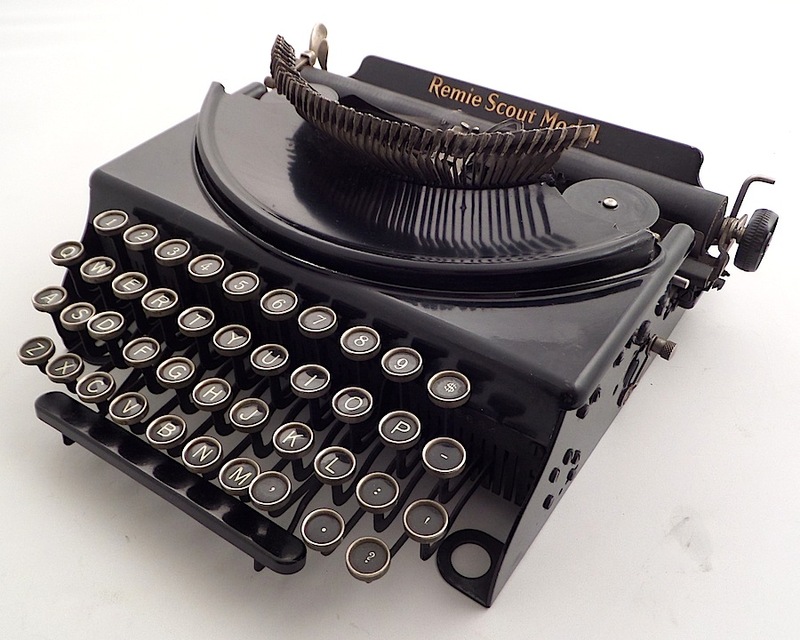 It may be that the earlier machines were “over built.” One can tell that less material was employed in the Remie Scout. 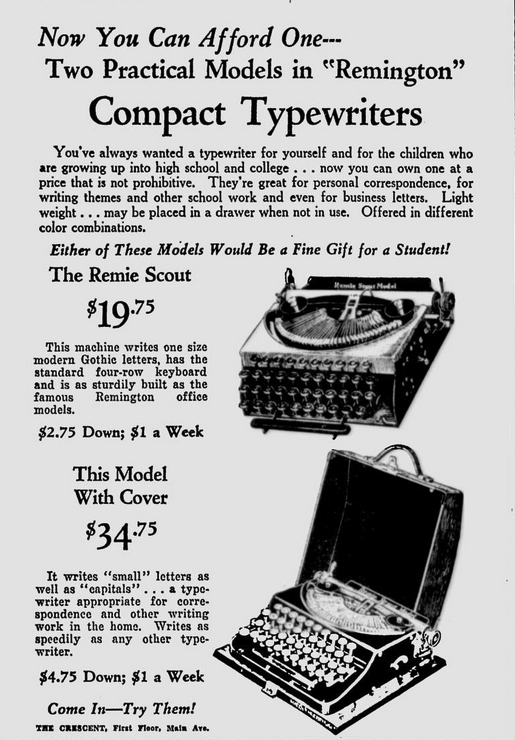 I’ve noticed elsewhere that the Remie is sometimes described as a children’s typewriter, but, given its build quality, that description is somewhat misleading. The Remie is solid. 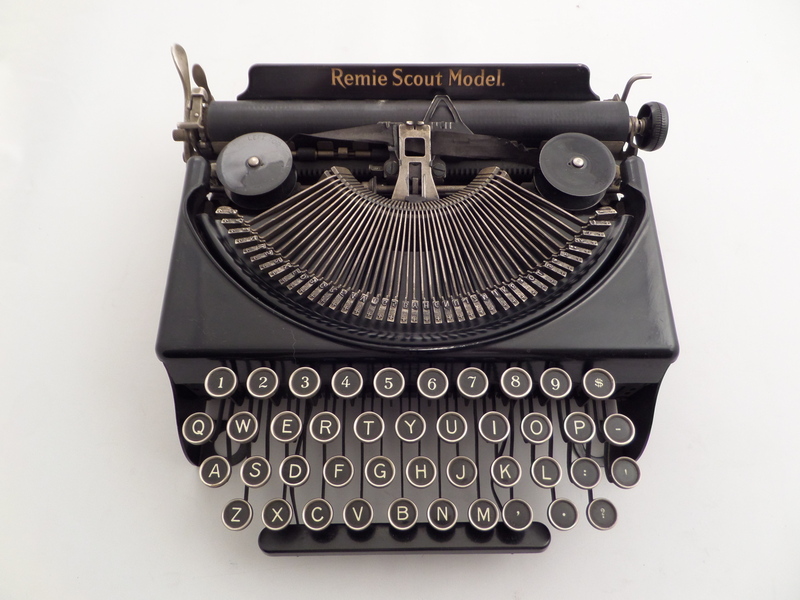 Just to second T. Munk’s thought: I enjoy writing with my Remie Scout Model. And, let’s not forget an added bonus: as a stripped down machine (mine is the no shift, no front frame, no return lever variety) it’s amazingly easy to fix.